Trees benefit from regular care to ensure they remain healthy and safe. Neglected trees can quickly become dangerous. 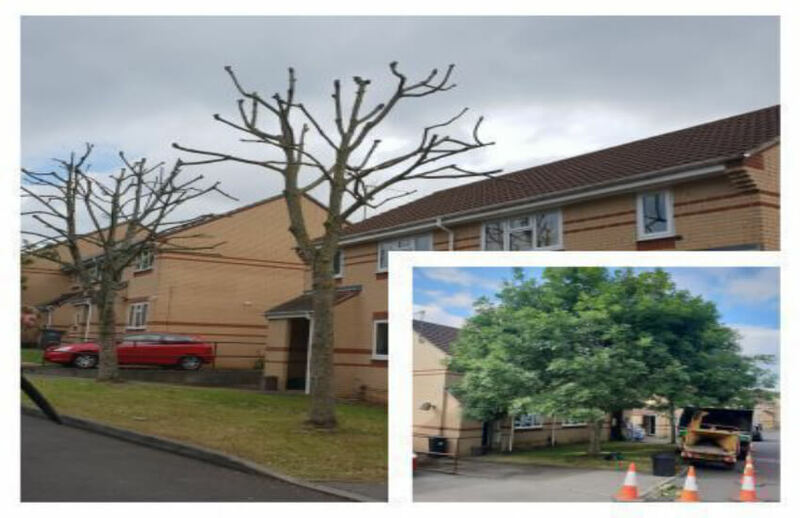 Trees with dead, diseased, over-extended or defective branches will often break and fall damaging property and endangering life. Damaged trees or trees with dense crowns can blow over in high winds and cause serious damage. Often trees become too big and need to be reduced. They grow limbs that hang low over roads and need to be lifted. Our tree surgery partners are professional, polite and friendly and all staff are trained to NPTC standard. All work is fully insured. We only use modern and efficient low-emission chainsaws and environmentally friendly, biodegradable chainsaw oil. All waste is recycled – nothing is wasted and sites are always left clean and tidy. 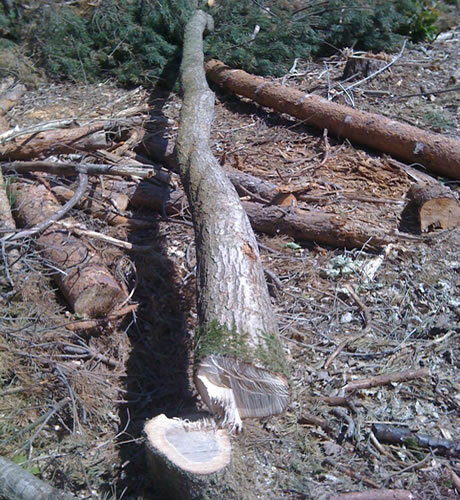 Avoid the pitfalls and shocks of emergency tree works. Get Ambience to provide you with a quality 5 year tree plan with budgets, descriptions, location plans and photographs. Crown reduction is when we reduce the height and/or spread of the crown of a tree by pruning the ends of branches. The natural shape of the tree is preserved as far as possible. Dead, diseased or damaged wood is also removed throughout the crown at the same time. No more than 33% of the crown is removed at any one time. All smaller diameter branches (up to 5 inches) are chipped and can then be used as garden mulch. Crown thinning is the selective pruning of branches throughout the crown. This increases light penetration and air circulation throughout the crown. The overall shape of the tree is not significantly changed. This reduces the “sail effect” that can put extra stress on the tree in high winds. Dead, diseased or damaged wood is removed at the same time. No more than 33% of the crown is removed at any one time. All smaller diameter branches (up to 5 inches) are chipped and can then be used as garden mulch. Larger branches are cut, split and seasoned for firewood. Nothing is wasted. Crown lifting involves removing just the lower branches. This is often done to provide clearance, over paths or driveways, or sometimes to allow more light to pass beneath the crown. Crown lifting often has limited impact on the look of a tree because it does not affect the upper crown. All small diameter branches are chipped and can then be used as garden mulch. Larger limbs are cut, split and seasoned for firewood. Nothing is wasted. Pollarding is a pruning system in which the upper branches of a tree are removed, promoting rapid growth of dense foliage and branches. 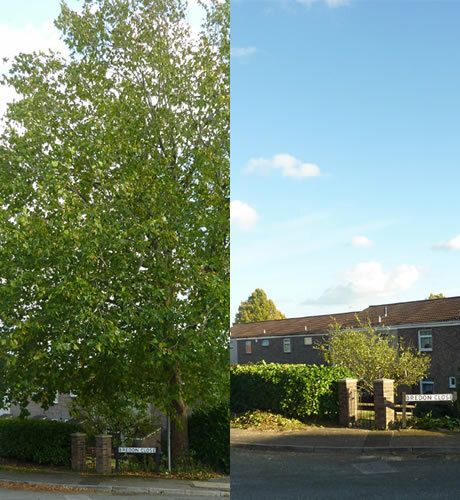 It’s often done to street trees to contain their size. Only species with vigorous epicormic growth may be made into pollards (Oak, Beech, Willow, Maple, London Plane and Horsechestnut being the most common). Once started, pollards need to be “re-pollarded” every 3-5 years. Often there’s no option and a tree needs to be removed. The trick is doing it safely. Where possible the simplest way is to fell the tree then dismantle it on the ground. Obviously this is only possible where there is enough space to do so. There are several specialist cuts used to fell a tree safely, which we use depends on the lean of the tree, assessing any tension in the trunk. Our favorite being the Ninja Death Cut. Sometimes called Sectional Felling, this involves climbing the tree and dismantling it one branch at a time. The trunk is then taken down in small sections, often using specialist lowering equipment to safely drop the wood to the ground. This technique is used where space is limited and felling isn’t an option. A Tree survey is an important survey that is performed on private or public landscapes. The goal of the survey is to provide useful information on the trees so that property managers or homeowners can make informed decisions. Based on the information that they receive from the survey, they may then decide what to do with the trees. 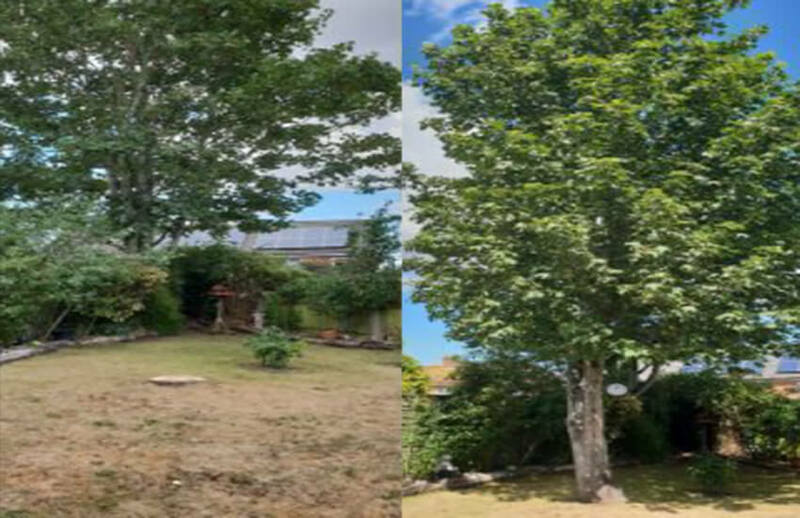 Why do you need a tree survey ? Species of the tree based on scientific name. Physical measurements of the tree such as height and diameter. All surveys with Ambience Trees are conducted by are trained and qualified arboriculturalist. He will be able to present the information in an easy to understand manner. All trees will be tagged with special tags and numbers. These numbers can be cross referenced with a special summary table, which reveals the meanings of these tags and numbers. Only after a tree survey should actual work start on a piece of land. When you have a tree cut down, rarely is stump removal included in the package. (With us it is) This leaves you with three basic choices: leave the stump as is, dig it out, or grind it down. Leaving the stump is usually not a good idea. A stump can become a home to all manor of insects other pests. It can mar the beauty of your garden, damage lawn mowers, and even ruin paths and foundations. Digging the stump out is often impratical. To successfully remove a stump from the ground, a huge hole must be dug, involving a lot of time, effort, and, occasionally, money. Even then, you may not be able to remove every root. This leaves the third option. 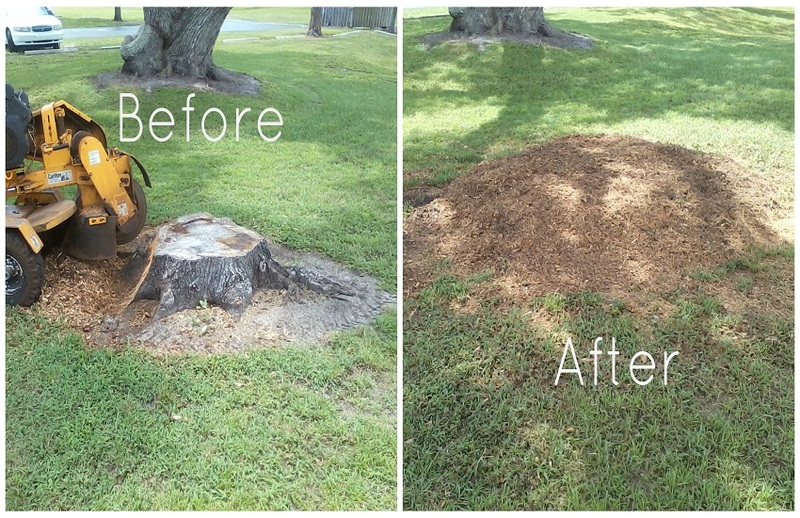 Stump grinding involves using a large machine to chip away the stump to a few inches below ground level. The machine can be anywhere from the size of a lawn mower to the size of a truck, though it is always dangerous. The grinder has teeth or blades which slowly chip away the wood, reducing it to flying bits. For this reason, protective gear, such as goggles and appropriate clothing should be worn. We take away this worry, by using Ambience, we will take away your tree from top to bottom, inside are orginal costs, so theres no hidden extras, you can rest assured your tree issues are dealt with when you choose Ambience for all your tree needs. Ambience Landscapes Ltd serve the South West: Bristol, Gloucestershire, South Wales, Wiltshire, North Somerset and Taunton. If you’d like to contact us to arrange tree services, or to ask any questions at all – please don’t hesitate to do so. You can call us on 01179711742 – for other ways to contact us, please click here to visit our contact page. If you require emergency treeworks out of normal office hours, we operate a 24 hour emergency call out service. Please call 07973 405 098 or 07854 804 063 if you require emergency works. Would you like to use our tree maintenance services?